All orders can be tracked via the Royal Mail website. *If you return an item and received free shipping, then you are responsible for not only the return charges to get the item back to us, but we will deduct the original amount that we paid for the item to get to you. If you want to know what the original amount of shipping was, just call us or email us and we are happy to tell you. We strongly suggest you insure the item as we are not responsible for lost or stolen items. We offer free Europe shipping for orders over £25. We also ship our products to customers worldwide. Here are the list of charges for shipping to the USA, Canada, and the rest of the world. 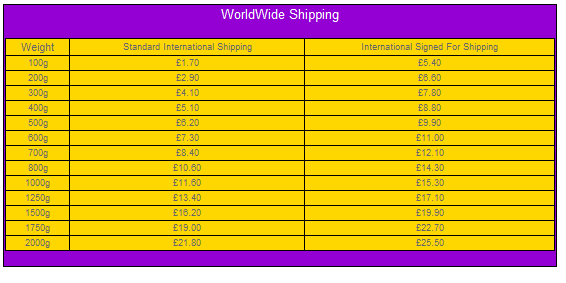 Most orders received before 3:00PM GMT (Monday – Friday) will ship the same day, provided the product ordered is in stock. Most orders received after 3:00PM GMT will ship the next business day. Orders are not processed or shipped on Saturday, Sunday or Public Holidays. Any order discrepancies relating to missing/lost items must be reported to us in writing via our online contact form at least after seven working days have passed from the time your order was dispatched. We cannot refund or replace lost items until 15 working days after the date of dispatch (25 working days for international items) – this is when Royal Mail classes items as being lost. Items not received but tracked as being delivered – This frequently happens when items are delivered to places of work. In some cases, your item might have been delivered to a post room or colleague within your company and someone else will have signed for it. In these cases, you can request a proof of delivery certificate from the Royal Mail website www.royalmail.com by filling in a signature request form. Please note that we do not refund or replace items that are tracked as being delivered. For this reason, we always recommend that you get items delivered to a secure address. Bandana-World cannot be held responsible for goods that are lost or delayed in transit. Next Business Day Delivery – Delivery GUARANTEED by end of next working day. Order must be placed before 2.30PM GMT (Monday – Friday). Please note signature is required on delivery.